In the last article we covered the basics of sharpening, or, at least, how to hone carving tools with the emphasis on keeping them sharp enough to do what we need them to and produce work of a high standard. We also covered how to modify a simple bench grinder to make a reasonably cheap and efficient honing and polishing machine. For many carvers, this is enough to keep their tools sharp and suitable for satisfactory results. There are, however, several alternative methods to produce the same result and which of these the carver wishes to use is simply a matter of choice; all of them work very well but will suit some better than others. Before we look at these, we need to be clear about exactly what we are hoping to achieve. We want a tool that will cut cleanly through, or into, a variety of woods of varying degrees of hardness with the minimum of effort. If the cutting edge is prepared and maintained correctly it should do all that the average carver will need. If this is the case it doesnâ€™t really matter what it looks like. Many carvers spend a huge amount of time trying to get bevel angles right and edges square yet the tool still doesnâ€™t cut properly. This is particularly common with V-tools where there are so many different opinions about the correct angle of the cutting edge. If you get the angle of the bevel on each side and the â€˜Vâ€™ at the bottom the same, the tool will do the job it was designed for, irrespective of what this angle actually may be. 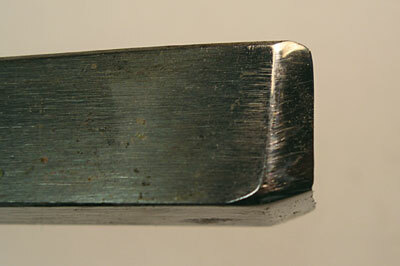 When looking at the tool from the side, the bevel will actually be longer at the bottom of the â€˜Vâ€™ than at the side as there is a greater thickness of metal there. So, if you are not keen on using a power hone for your tools what are the alternatives? First of all you need to get a flat bevel on the tool. Unlike a carpenterâ€™s chisel which has a hollow ground bevel with a second smaller bevel at the edge, carving tools lack a second bevel. This means when grinding the initial bevel on a grinding wheel you hold the tool at right angles to the wheel and gently rock it up and down until the correct surface is achieved. This can be done equally well on a fine grindstone or diamond-impregnated silicon wheel. It may take a little practice to get it right but it is worth taking the time. A similar result can be obtained by using a flat diamond plate or block, or any of the variety of oil stones that are available. I have even seen carvers use wet and dry abrasive paper to great effect and, in fact, if only a fine paper is used, minimal honing is necessary. I prefer to stay away from water stones because even if the tools are oiled after grinding, they can still end up with rust on them as the steel absorbs water. Power honing can produce enough heat to dry the tools out but hand honing will rarely do so. Grinding in this fashion will produce a burr on the cutting edge and the bevel will need to be well honed on the outside with a leather or webbing strop as well as on the inside with a slip stone or shaped honing stick. The addition of a polishing compound or chrome cleaner will assist the process. Many carvers nowadays are carving with only a knife, small palm chisels and gouges and therefore don't wish to invest in a power hone or expensive diamond or oil stones. These more abrasive compounds can seriously damage smaller tools beyond use. But never fear, help is at hand. MDF has never had a particularly good press - the dust is dangerous and most cheap furniture is made from it today. However, it is brilliant for honing carving tools of all sizes - particularly the smaller ones and V-tools that scare most carvers. 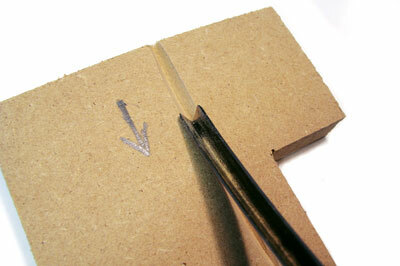 A very effective, and cheap, honing block can be made from just a small offcut of material. You cut a groove in the surface of the board with the tool you wish to hone and then drag the cutting edge back through the groove, keeping it at a constant angle with the whole of the bevel in contact all the time. 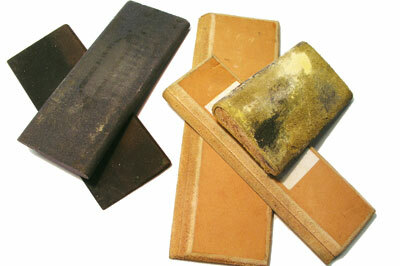 You don't need any grinding or polishing compound as the MDF is extremely abrasive. As long as this is done regularly and carefully you will be able to maintain a flat bevel and a sharp cutting edge with no other attention. Eventually the groove will become glazed, reducing its efficiency. 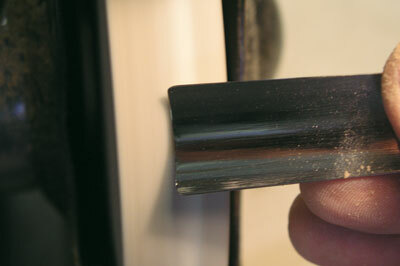 In this case, you can either add some chrome cleaner as an extra abrasive or simply cut another groove. If you have trouble getting V-tools sharp use this method, it will change your life! I have used it for years with miniature carving tools with complete success and, when working in conditions where no power is available, have had no problem keeping my normal tools as sharp as I would like. If there is a need to remove a burr from the inside of a gouge or V-tool, turn the tool over and use the corner of the block as a slip. With a little shaping and initiative, all sorts of shapes can be achieved. To sum up and quote an American carver: "If you want your tools to remain sharp, don't let them get dull!" In other words, hone your tools regularly - every 30 minutes of use - this way you won't have to do any remedial work unless any damage occurs. Working this way you will only lose 10-20 seconds of carving time. If you resort to using abrasives this will increase to around 20 minutes and I'm sure, like me, you'd rather be carving! Peter Benson has been carving since he was 11, discovering his passion when evacuated from his home during the war, making daggers and planes with his pocket knife. He became a P.E. teacher before moving on to teach children with special educational needs, finding the time for carving along the way. 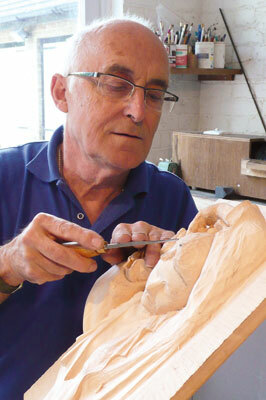 Since retiring, Peter set up the Essex School of Woodcarving in his studio home, tailoring his courses to the requirements of the individual.